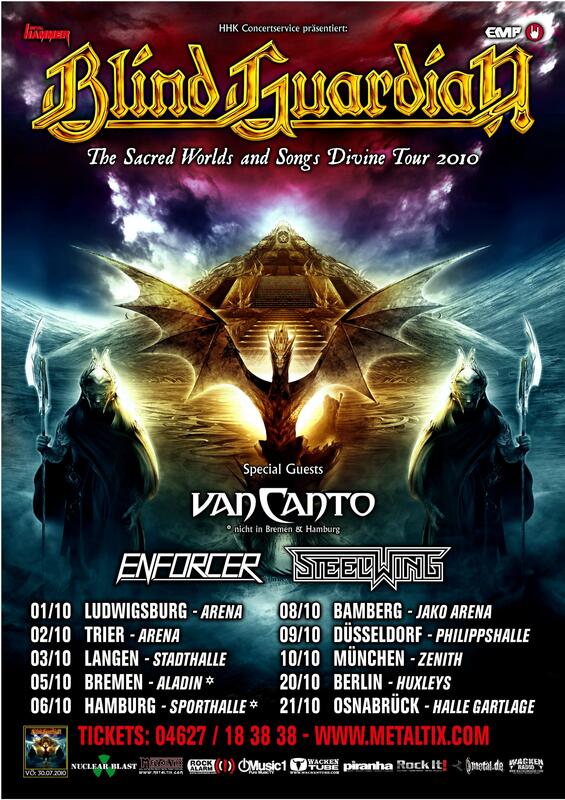 Starting at the beginning of September the poster for the Blind Guardian 2010 German tour will start popping up around the country. To celebrate this tour we are holding a contest where you can win an exclusive meet and greet with the band. We will be giving away ONE meet and greet package per city on the German tour. This means ONLY for the shows in Ludwigsburg, Trier, Langen, Bremen, Hamburg, Bamberg, Düsseldorf, München, Berlin and Osnabrück. Each meet and greet package will include 2 tickets to the concert and the opportunity to meet the band. Take a picture of yourself in which you are standing (or sitting, laying, whatever) beside the tour poster. 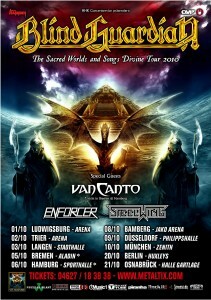 Send this photograph to contest@blind-guardian.com. The subject of the e-mail must have the following format: “CITY NAME: Meet and greet contest Germany 2010” where CITY NAME is the name of the city of the concert you would like to attend. For example “HAMBURG: Meet and greet contest Germany 2010”. In the e-mail please include the following information along with the photograph: Name, E-Mail address, Mobile phone number, City where you saw the tour poster. Entries with a subject line format different from that shown above will be deleted. Multiple entries by the same person (even if for a different city) will be deleted. Entries will be accepted up to the end of the day on Wednesday, September 29nd, 2010. Any entries received after this date will be deleted. A random drawing will be done from all the entries for each city (10 winners in total). Winners will be notified via e-mail and/or telephone and also be announced here on the website. Good luck, we are looking forward to seeing your photographs and to meeting the lucky winners on tour in October.